Many homes across the nation have a laminate countertop in their home, but these countertops must often be replaced because the homeowners do not understand what the properties of the laminate countertop are. Although these countertop surfaces are inexpensive compared to many other types of countertop surfaces, they can become a major expense to the homeowner if they have to repair or replace the countertop on a regular basis because of damage or breakage. By understanding what the properties of a laminate countertop are, the homeowner can avoid damaging the countertop and having to replace it because it looks terrible. 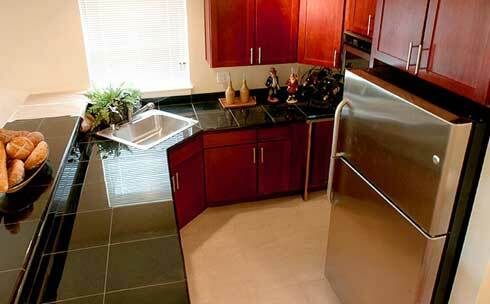 One of the best properties of a laminate countertop is that the countertop is non-porous. This makes the countertop stain resistant because spills are unable to penetrate the surface of the countertop and create mold and bacteria to grow. Because the surface of the countertop is non-porous, it is also very easy to clean as dirt and spills can be wiped from the surface of the countertop using nothing more than a damp, soft cloth. In order to keep the laminate countertop looking new, any spills, dirt, or food residue should be cleaned from the surface of the countertop as quickly as possible. Harsh cleaning chemicals are not needed to clean the surface of the countertop properly and abrasive scrubbing tools will only mar the surface of the countertop. A simple solution of soap and water should be enough to remove even the most stubborn items from the surface of the countertop. Laminate countertop surfaces are not heat resistant and placing anything hot on the surface of the countertop can cause severe damage to the countertop. This property of laminate countertops is the one that many homeowners do not think of and is often the cause of the countertop having to be replaced due to extensive damage. A hot pot or pan should never be placed on the surface of a laminate countertop without some sort of protective item, such as a pot holder or dish towel, placed between the surface of the countertop and the hot item. There are a number of different items that can damage a laminate countertop because they are susceptible to scratches, nicks, cracks, burns, and breakage. Laminate countertops are not made from the strongest materials, resulting in the inexpensive cost of the materials, so caution must be used when performing normal chores and activities on the countertop. Homeowners are advised to avoid cutting food directly on the countertop surface, dropping heavy items on the countertop, or placing sharp objects on the countertop as each of these actions can damage a laminate countertop beyond repair. Some minor damage can be repaired using a laminate repair kit sold in many home improvement stores, but if the countertop becomes severely damaged or broken, the only option for the homeowner is to replace the entire laminate countertop.